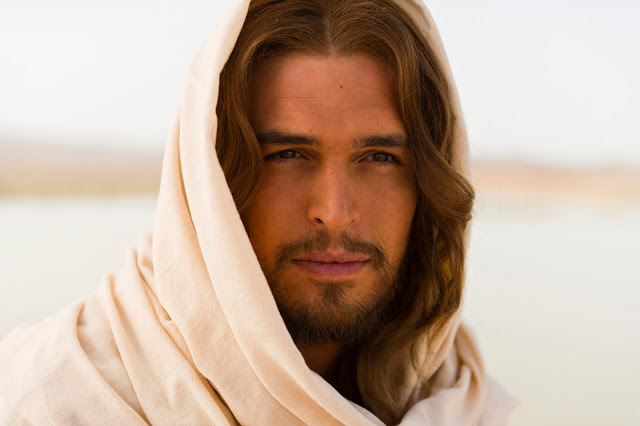 After Jim Caviezel's breakthrough performance to the role of Jesus Christ in the 2004 movie, "The Passion of the Christ," the most popular biblical character will have its 2014 reboot via the movie “Son of God,” this time with Diogo Morgado portraying the most-loved character in the bible. "Son of God" will rise in cinemas from the pages of the bestselling book of all time, the Bible, which tells the story of Jesus, in the greatest story ever told for a whole new generation. “Son of God” is directed by Christopher Spencer who also shares writing credits with Richard Bedser, Colin Swash and Nic Young, the movie features powerful performances, exotic locales, dazzling visual effects and a rich orchestral score from Oscar®-winner Hans Zimmer. The movie introduces Portuguese actor Diogo Morgado who beautifully portrays the role of Jesus with Roma Downey as Mary, Darwin Shaw as Peter, Amber Rose Revah as Mary Magdalene, Greg Hicks as Pontius Pilate and Sebastian Knapp as John. The producers and filmmakers have successfully brought together leaders across all denominations, creating an experience that is endearingly common to all making it relevant to today’s audiences. Pastor Rick Warren says, "I’ve seen most of the films about Jesus produced in the past 50 years. “Son of God” stands alone, in a class by itself. It is a powerful and poignant movie, the best Jesus movie I have ever seen. I am thrilled that Twentieth Century Fox is distributing this film and I know it will be a blessing to millions when it opens all across America on February 2014." Rev. Sam Rodriguez, President of the Hispanics Evangelical Alliance says, "Son of God” fills the big screen with two catalytic elements: the passion of the cross and the purpose of the empty tomb, forgiveness and eternal life. It is not just a production worth watching it is a gift worth experiencing." Cardinal Donald Wuerl, Archbishop of Washington DC, says, "I would recommend to individuals, and particularly to families, this wonderful story of the Son of God in order to be inspired all over again with the story of God’s love for us. It is a joy to watch this film bring alive the pages of the Gospel to help us see what those who lived at the time of Jesus experienced." The producers are thrilled that their Jesus narrative will finally be seen on the big screen. "We are very excited to be working with Twentieth Century Fox to release “Son of God” as a major motion picture," said Roma Downey and Mark Burnett. "We responded to an overwhelming demand for the greatest story ever told to be seen as a shared experience on the big screen. The result is a beautiful stand-alone movie. It's the story of Jesus for a whole new generation." Mark Burnett and Roma Downey have succeeded in doing what few before them have done; they have produced a film that tells the story of Jesus and touches the heart. "Son of God proves that when talent and passion collide, the outcome is spectacular," said Joel Osteen, Senior Pastor of Lakewood Church and #1 bestselling author. "Having spent time with them on the set, Victoria and I witnessed firsthand the deep and abiding passion they both possess for God's Word." “Son of God” will open nationwide in the Philippines on February 26, 2014 from 20th Century Fox. Below is the official movie trailer for "Son of God."